The Airport and Draper TRAX light rail lines were among four new lines that UTA opened in the 12-month period ending in Dec. 2013. The award is considered the most prestigious of all honors to be handed out at APTA’s national convention in October. It is bestowed on public transportation systems that have demonstrated “achievement in efficiency and effectiveness.” There are three such awards based on the size of the transit system. UTA won in the largest category, for systems providing 20 million or more annual passenger trips. UTA General manager Michael Allegra, who oversaw a year of record ridership, topping 44 million boardings, and the opening of multiple new rail lines, will accept the award on behalf of the agency. 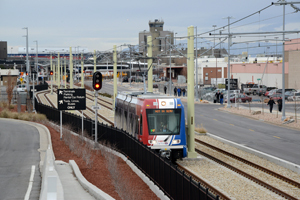 Besides achieving an all-time high in ridership in 2013, UTA concluded its FrontLines 2015 program with the opening of the Airport and Draper TRAX light rail lines. Additionally, in a 12-month period ending in December 2013, UTA opened four rail lines, including one commuter rail line, two light rail lines and Utah’s first modern streetcar line. broke ground in 2008 with a plan to build 70 miles of rail in seven years. The program was completed two years ahead of schedule and $300 million under budget. This is the fourth time UTA has been named APTA Outstanding Public Transportation System.